Almost 19 million Yemenis require humanitarian support, said Minister Charlie Flanagan. 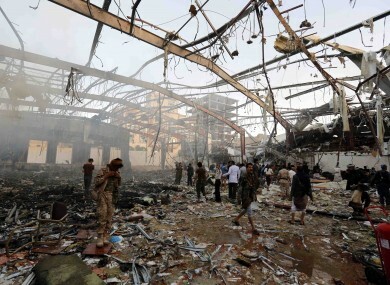 The aftermath of a Saudi-led airstrike in Huthi-held territory in Yemen. THE IRISH STATE has donated a further €2 million to Yemen, bringing its total funding since 2016 to €4 million, to help meet the urgent needs resulting from the Middle-East country’s civil war. Minister Charlie Flanagan said the country is at risk of becoming a “failed state” with a generation of children growing up “malnourished and without education”. While much of the focus has been on the situation in Syria, and the crumbling city of Aleppo, little attention has been paid to what is going on in Yemen, where President Hadi’s government forces, along with Saudi Arabia, have fought Huthi rebels since 2015. Britain and the US have backed government forces in the siege, and are helping Hadi hold his position as leader of the country. In October, the US Navy said missiles had been fired at its ships from Huthi-held territory in Yemen. They responded with a direct attack of her own. Before Christmas, the Pentagon confirmed that 28 “terrorists” had been killed in Yemen in nine US air strikes in recent months. Al-Qaeda and the rival Islamic State group have taken advantage of chaos in Yemen to reinforce their presence in the Arabian Peninsula country. Yemen’s war has killed more than 7,000 people since the Saudi-led coalition began its military intervention in March 2015, according to the United Nations. The civil war has made the need for humanitarian aid in the region dire. The Irish government said this donation will deliver life-saving assistance to civilians on the ground in Yemen. Minister for Foreign Affairs, Charlie Flanagan, said: “I have been monitoring the situation in Yemen with growing concern. The number of people now in need in Yemen exceeds those in either Iraq or Syria. Almost 19 million Yemenis, 70% of the population, urgently require humanitarian support. More than 14 million people are living without access to adequate food, safe water and sanitation, and over three million people have been forced to leave their homes. Minister of State Joe McHugh added: “This fund supports local coordination efforts by providing funding to the best placed local and international partners to deliver life-saving assistance to those in need. The UN informed us last week that rates of new cholera cases have reduced by 50% over the last year as a direct result of the UN work which this funding supports. Email “Ireland pledges €2 million to 'forgotten humanitarian crisis' in Yemen”. Feedback on “Ireland pledges €2 million to 'forgotten humanitarian crisis' in Yemen”.